View More In Thermometers & Weather Instruments. 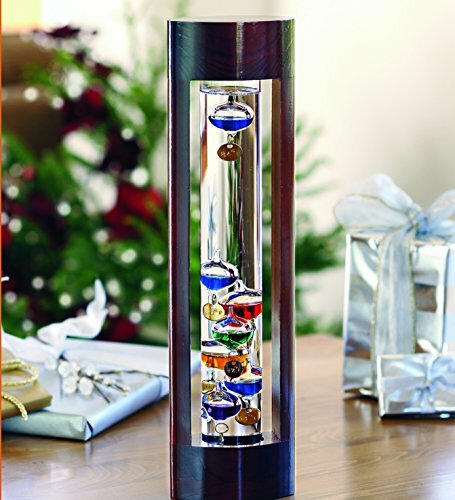 Rich jewel tones, gold-tone highlights, and cherry-finished wood satisfy executive tastes while the laws of physics stimulate the inquisitive mind with this Galileo Thermometer. Freestanding Galileo Thermometers show temperature changes as glass bubbles rise and fall within a liquid-filled tube. For the most accurate temperature, read the metal tag on the lowest bubble of top grouping. Range 60° to 84° F. Size: 14-1/2"H x 4"W.
If you have any questions about this product by Wind & Weather, contact us by completing and submitting the form below. If you are looking for a specif part number, please include it with your message.